If you find yourself with one day to spend in Singapore, due to a layover or an extra day due to a business trip, thank your stars. It’s the most exciting city to be stranded in for an extra day. Leave the airport and enjoy the city; there’s so much to see and do here, you’ll be begging for an additional day when your day is over. What you’ll notice first about Singapore is just how clean it is! There are strict laws against littering of any kind. In fact, you’ll end up paying a SD$1000 as fine if you happen to litter here. They don’t even sell chewing gum in Singapore because that would give people reason to litter. With that little fact as a teaser, here’s what we recommend for your one day in Singapore. 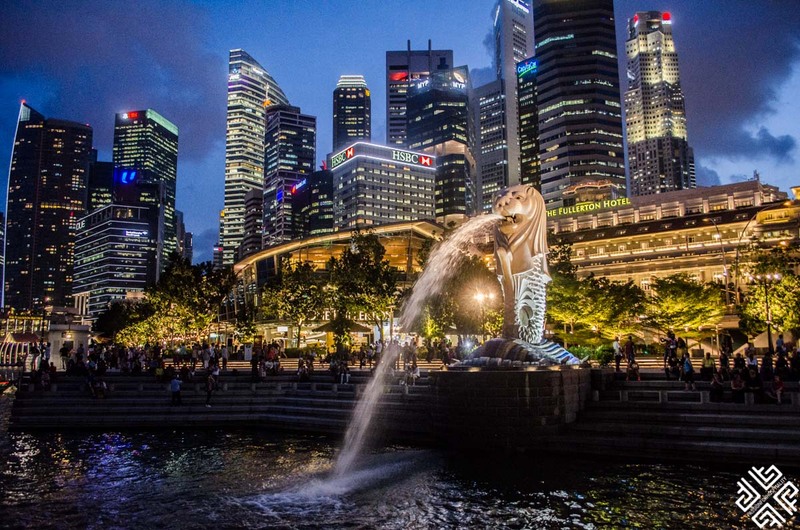 Also check out how to spend 4 days in Singapore. I took a taxi when I arrived at the Changi Airport, some taxis take credit cards but not all. However if you wish not worry about your transfer, you can also pre-book a private transfer in advance with Taxi2Airport here. 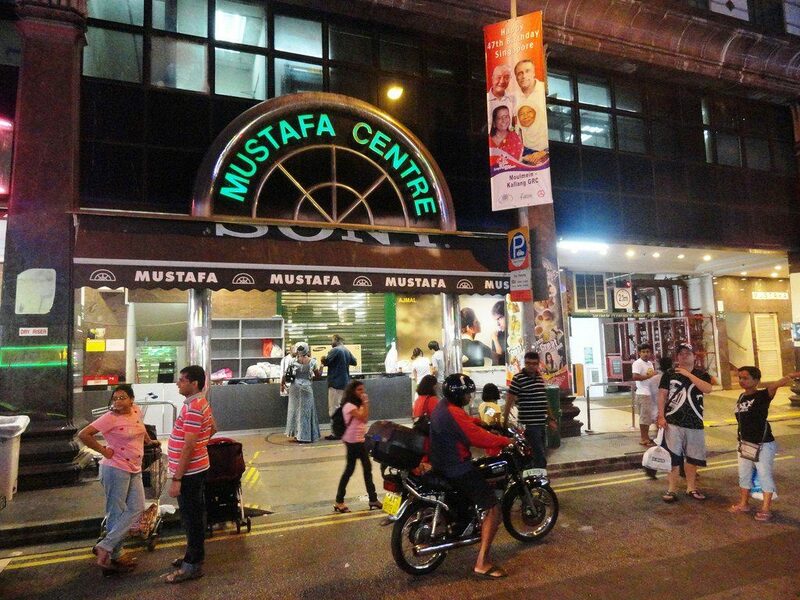 Mustafa Centre: Get to the Mustafa Centre to sample some found bargains on everything: perfume, clothes, souvenirs, makeup, electronics, sweets, groceries and more. There are several kiosks that offer travel and other services as well. The tables lining the sidewalks outside are for eating; Mustafa’s catering provides some scintillating food to keep you at the store. 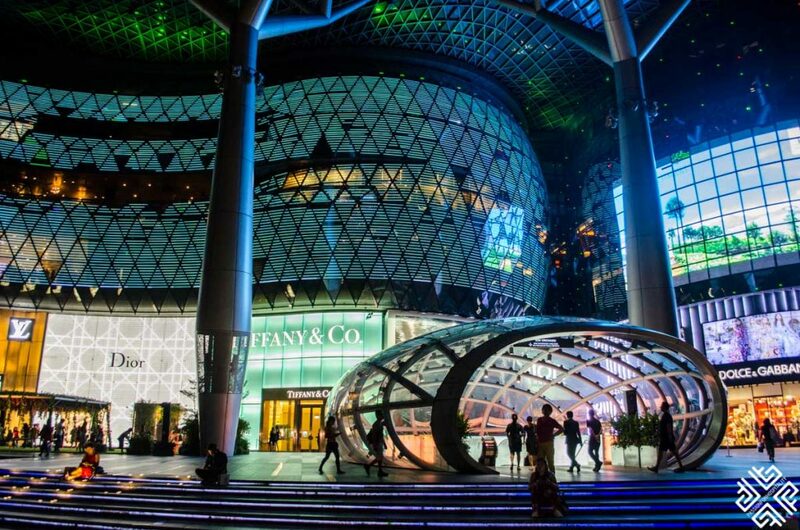 This 5-level, immense department store offers the most engrossing shopping in Singapore. 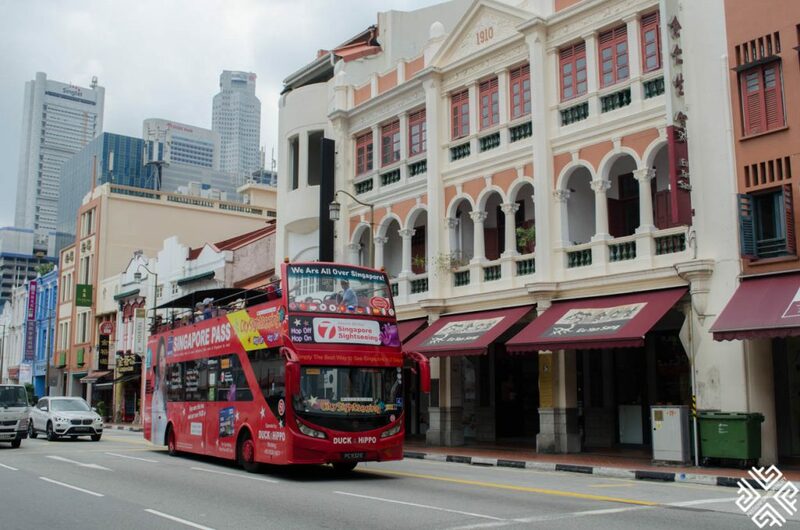 Oxford Street of Singapore: After you’re done with Mustafa centre, be sure to head to Orchard Street for some more shopping. Be warned that the noon sun will be hot, so decide on which malls to visit first. The entire stretch of Orchard Street is full of shops, retail outlets, malls, department stores and stalls selling everything from fashion, electronics to robots. There are malls dedicated to electronics alone! 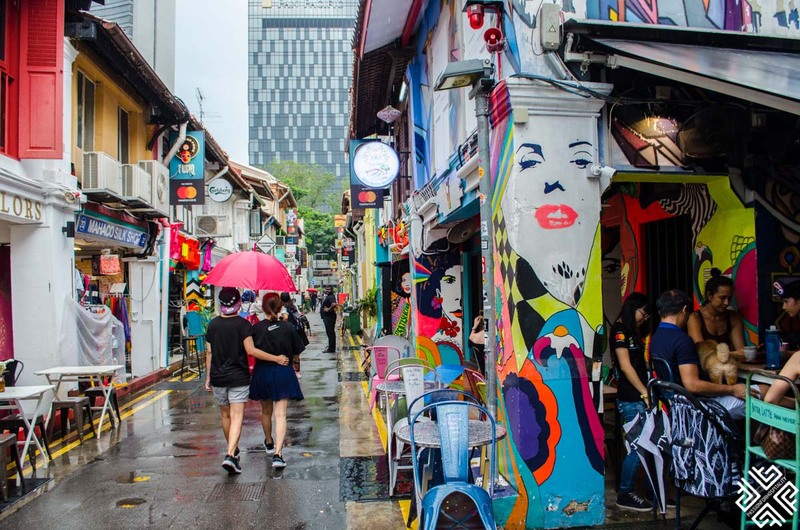 Arab Street: Arab Street is a textile Mecca; here you can leverage cut-rate deals on high quality clothes, jewellery, rugs, and more. There are many shisha bars and restaurants in this area as well. Kampong Glam, where Arab Street is located, provides for an interesting contrast to the rest of Singapore. Here you’ll find a collection of colourful buildings and typical Arabian structures surrounding the gleaming golden dome of the Sultan Mosque. After a vigorous afternoon shopping, head over Jurong Bird Park in the early evening. Here you can get the chance to meet and interact with thousands of birds! Jurong Bird Park is Asia’s largest bird paradise, which houses a collection of more than 5,000 colourful birds belonging to 400 species. The park is 20.2 hectares large, filled with giant walk-in aviaries and natural landscapes. You can join in during feeding sessions and clap along by the antics put on by the birds during the daily shows. 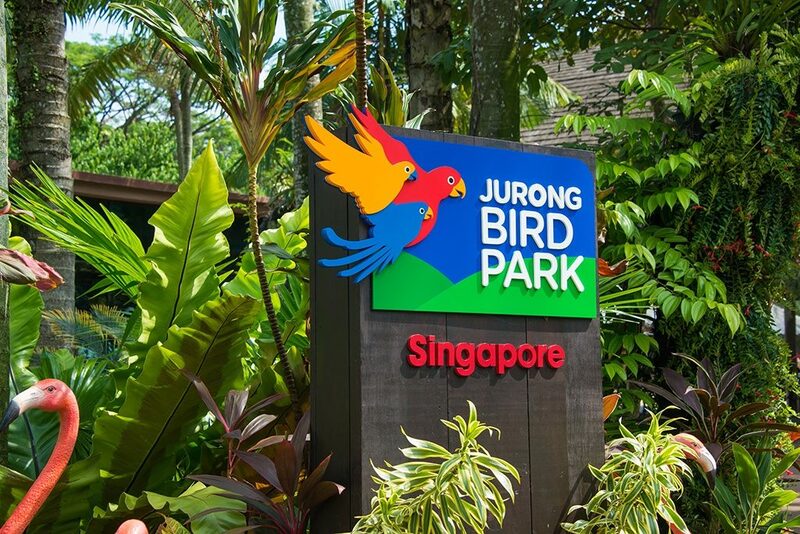 Jurong Bird Park throws on a feast every day, a sumptuous Asian buffet lunch that you can enjoy in the company of talented parrots. There’s a wet playground where kids can splash around, and play with birds. You can also ride a tram with your kids to check out more than 400 different bird species. The Singapore Flyer offers the best view of Singapore and beyond, so that’s where you can head next. The sunset is between 6:30-7:00 P.M., thanks to Singapore being on the equator. Watch the sun set over the city; you can see the whole of Singapore, its outlying islands and with lots of greenery and its older neighbourhoods. You can even see as far as neighbouring Malaysia if you look through a telephoto lens. A late evening Singapore River Cruise is just perfect, as the sun’s setting and the city lights come on one after the other. As the city darkens towards night, the view from the cruise is extraordinary. It’s a 40-minute cruise on the Singapore River ore River cruise that starts from the picturesque Clarke Quay. 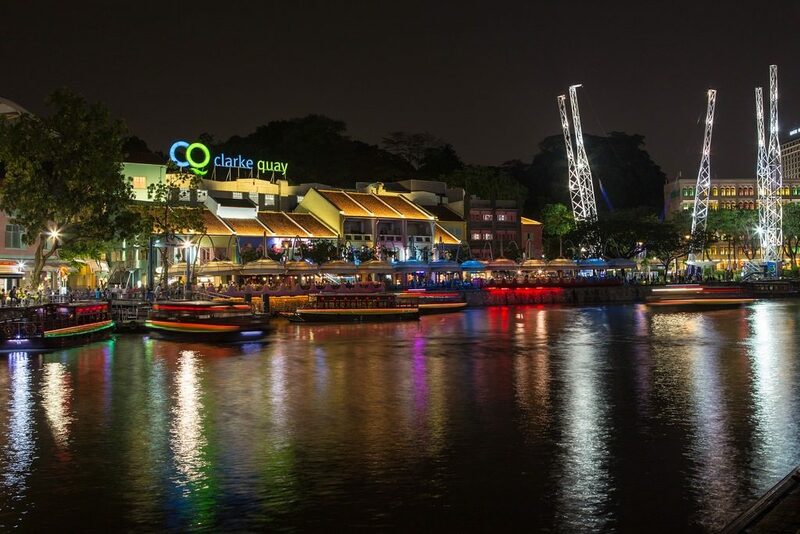 Clarke Quay is five blocks long and has a colourful collection of boutique shops, high-end condos, bars and international restaurants. As the cruise headed upriver to Boat Quay, you’ll learn that three-fourths of all of Singapore’s shipping businesses was handled from this quay. Behind Boat Quay you can glimpse the soaring cosmopolitan skyscrapers of Singapore’s financial and banking sectors. 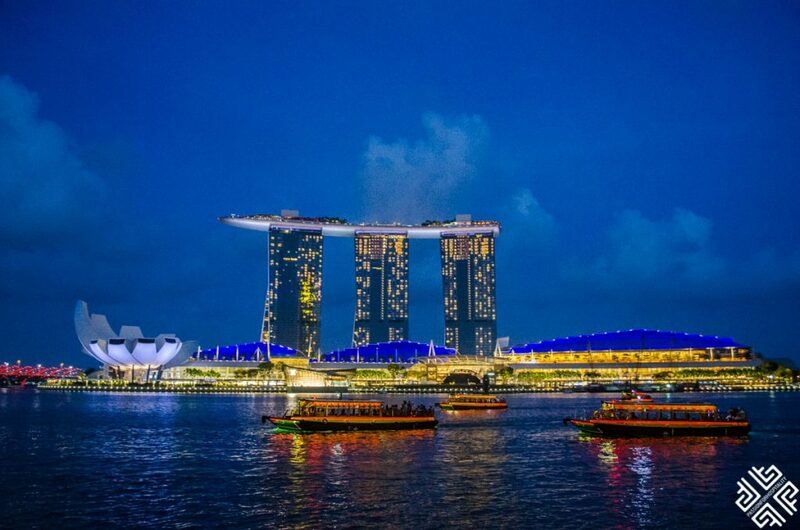 From the boat, you can see the lights show at the Marina Bay Sands go off exactly at 8 P.M. Pre-book your tickets online here. Enjoy the ultimate Night Safari experience, which is a combination of a VIP buggy-and-walking tour of the safari park. You’ll be accompanied by an expert guide, who will take you to the best spots for close encounters with the animals. There’s an open-sided Tram Safari, which takes you through 6 of the geographical regions in the world. It’s a 40-minute tram ride that comes with commentary. On this safari, you can enjoy an amazing nocturnal adventure, coming close to creatures like leopards, wolves, elephants, wallabies and more. The night safari also includes the Wallaby Trail, a walking trail which takes you among free-ranging wallabies and other creatures from Australia. Don’t miss out on the 20-minute Creatures of the Night Show, where you can witness the serval and hyena which will amaze you with their natural skills. Book your instant ticket and tram ride online here. 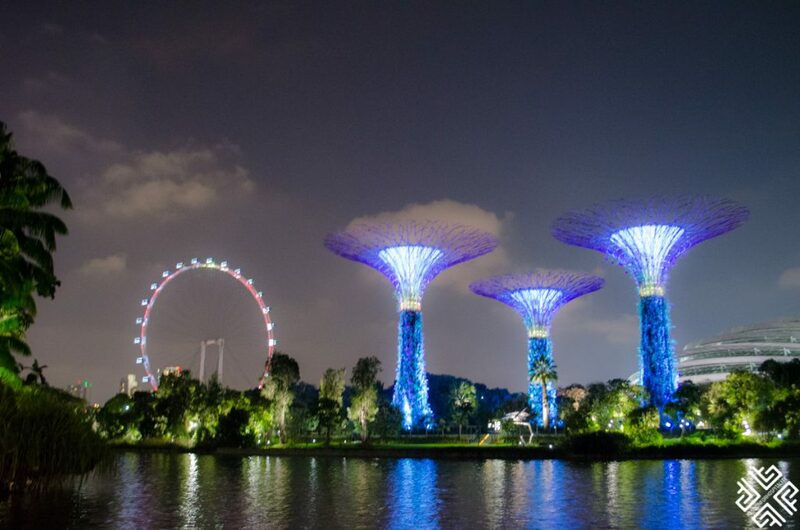 The Gardens by the Bay is open till 2 A.M. 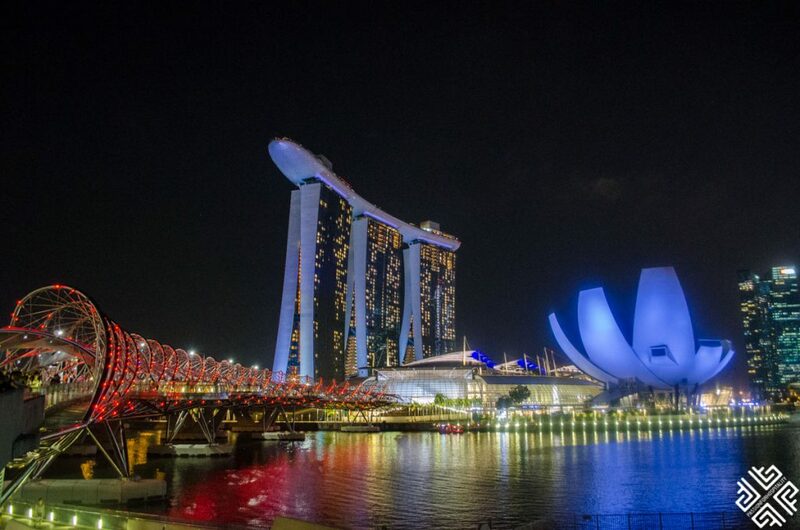 It makes for the perfect night adventure on your one day in Singapore. Looking at the futuristic park with its giant tree structures during the day is quite inspiring, but you should watch it at night. 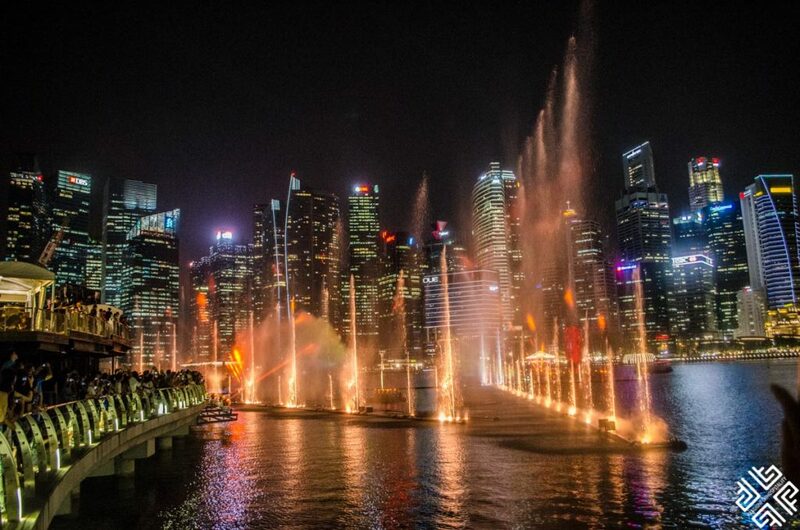 At night, the entire Gardens by the Bay turns into a lit up spectacle. 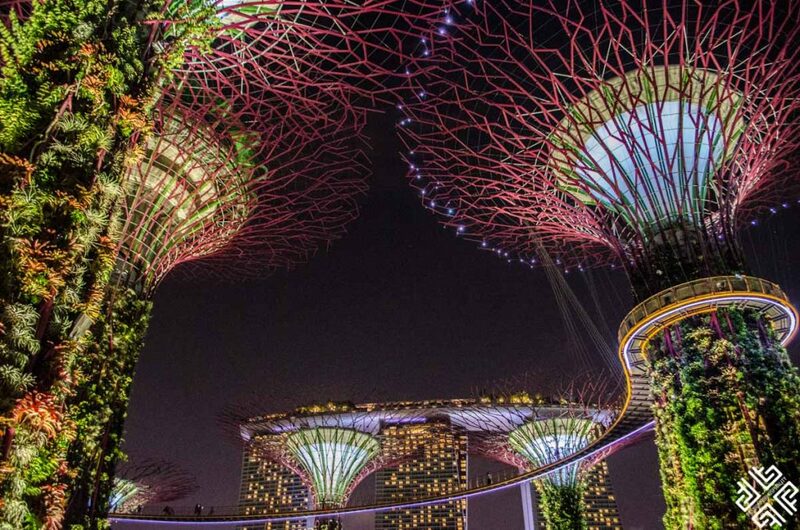 The towering 50-metre-tall supertrees in the ‘Supertree Grove’ are lit brilliantly with a kaleidoscope of colours. 12 supertrees stand tall and proud, connected by a walkway that takes you right to the top of the trees. These metal trees are covered by more than 200 different species of plants and flowers. The Gardens by the Bay puts on a light and music show when the whole garden seems to have come alive from some fairytale. The supertree in the center is home to the Supertree by Indochine, a restaurant that offers 360 degree views from the lounge. There’s also a tree-top roofless bar for drinks and cool fun into the dark of the night. The combined ticket for the Flower Dome and Cloud Forest costs SGD $28 and you will have to buy a separate ticket for the OCBC SKYWAY which is SGD $8 (separate queue). You can save money and time by buying a Gardens by The Bay & OCBC Skyway Combo Tickets here. I highly recommend buying tickets online to safe time and to avoid queues. 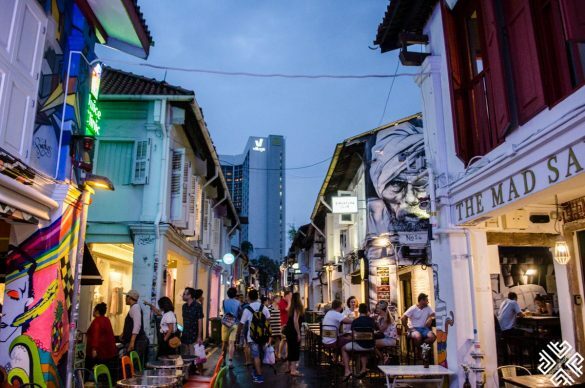 Singapore has a vibrant nightlife, and no trip to Singapore is complete without a taste of it. Clarke Quay is one of the most famous of Singapore’s night landmarks. 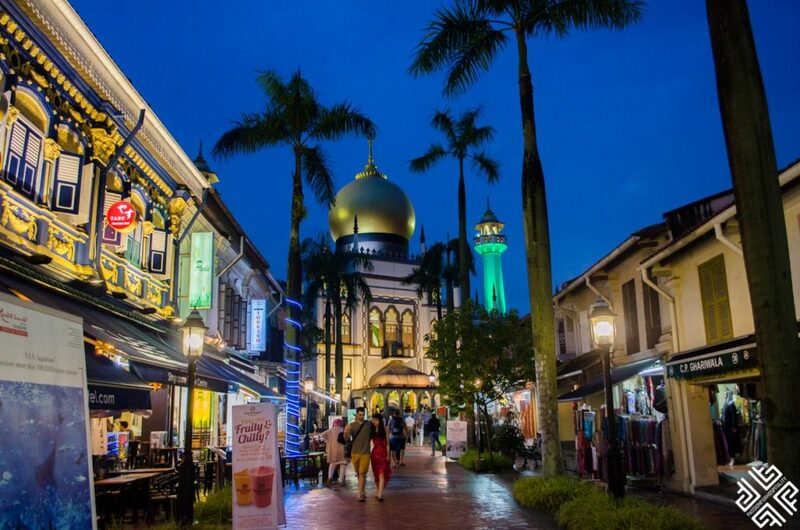 Set around a picturesque body of water, Clarke Quay’s swanky bars and restaurants line colourful boulevards. Here you’ll find excellent alfresco dining, great music, dancing, river-fronting pubs and bars and more. Be sure to check out clubs like Attica and Zirca and Hooters while you’re there. Alternatively, you can hit Marina Bay Sands, for a drink at the uber-cool CE LA VI bar on the 57th floor. Singapore does not sleep and while you’re there, neither will you. This vibrant, ever-alive and active city is meant for people who want to party all hours and enjoy everything life offers them. 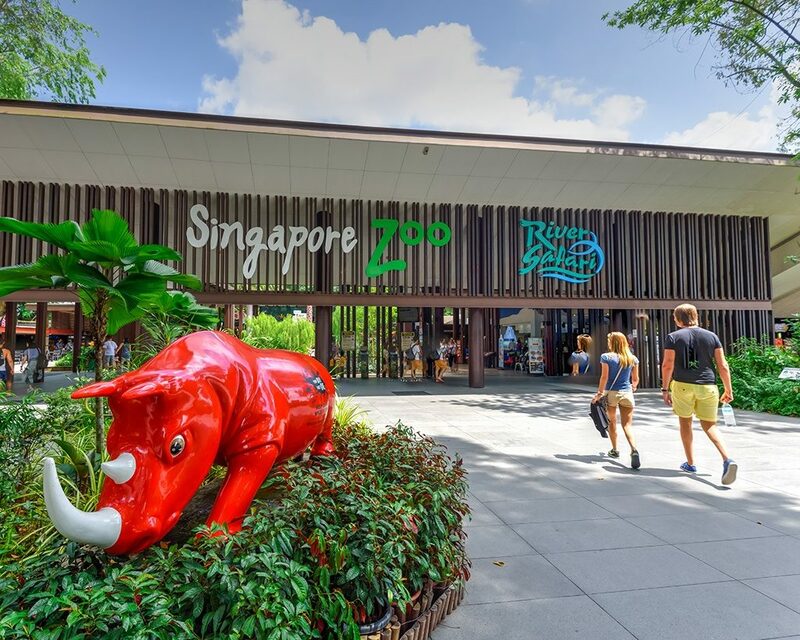 Be sure to make the most of your day in Singapore, and do plan a longer visit to check out the stuff you’ve missed out on your one day in Singapore!